The buzz is out: Eastfield’s new mascot is the bee. The college keep the Harvester name and blue and orange colors, but ditch the long unused image of a farmer for that of a pollinator. 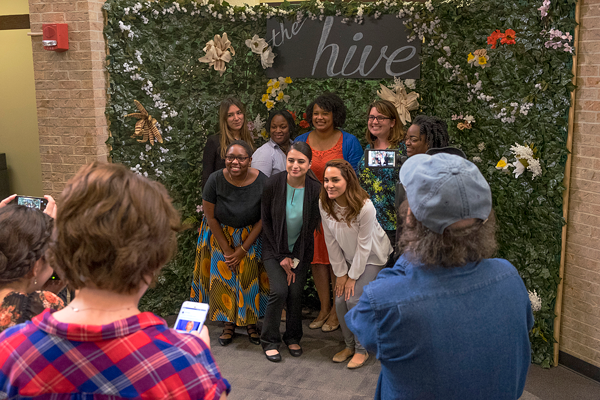 Suggestions to adopt the bee were presented to faculty and staff during the spring, and the decision to implement the mascot was made over the summer. Although there no official logo image, the bee has already been integrated into college marketing and outreach design elements. The website now sports a background design that resembles hive-like honeycomb and hexagons abound. “Come see what the Buzz is all about,” reads a message from President Jean Conway. While the administration is excited about the change, some student opinions sting. Marisol Munoz, an education major, thinks there are better options. Mike Harper, a business major, is firmly set against it. “Honestly, it doesn’t make sense to have the bee as the mascot and to still keep the name Harvesters,” he said. But student John Hassel, who is considering going into animation, sees the administration’s point. Also among the bee’s supporters are some of the faculty and staff, including technical theatre coordinator Lori Honeycutt. Honeycutt believes that a majority of the faculty and staff support the idea of a bee mascot, and those who oppose it fail to see the benefit it brings. During fall 2017 convocation, Conway officially announced the bee as the mascot, emphasizing that it could be integrated in every aspect of the college experience. Conway said the presence of a mascot will benefit branding and school pride, as well as giving students a sense of belonging. She closed by speaking on how representative the bee is to the goals and spirit of the college. “Above all, we want an image to portray what we do, how we do it, and most importantly, why,” she said. An official logo is planned to be finalized in the spring.